I won’t go so far as to call this sauce by the Italian “salsa verde” because genuine salsa verde in Italy is something different and more complex than this sauce–it is a concoction of parsley, pickles, boiled eggs, capers and shallots. It is a northern Italian specialty served with boiled meats (bollito misto) and vegetables. My neighbor Beppi is an expert at making salsa verde and one day, I will publish his recipe. 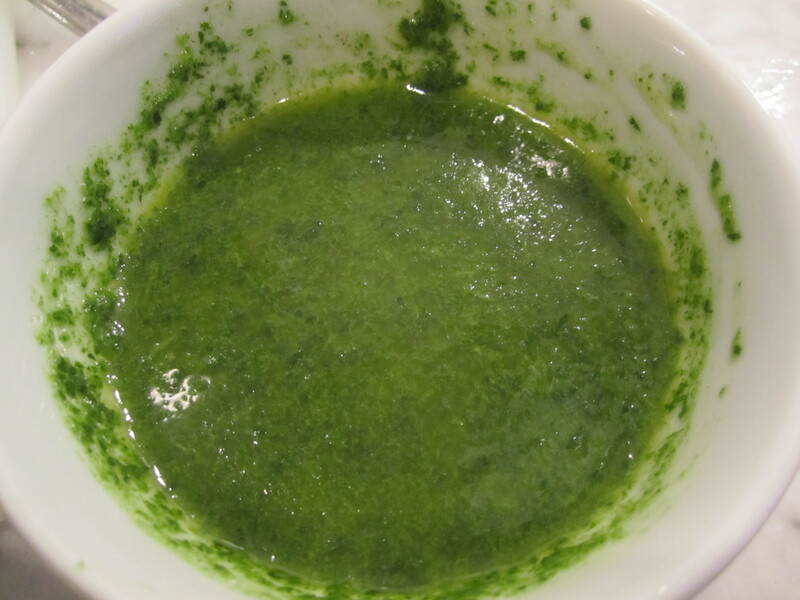 This sauce, however, is a variation on a condiment we used to make at Po Restaurant–green oil. Green oil was more of a garnish on the plate, rather than an actual sauce. It was made by processing parsley and a few spinach leaves with lots of oil, then straining. It made the brightest greenest streaks on almost every plate that was served at Po. For my green sauce, I’ve added chives and left the sauce unstrained. I’ve also added a touch of red wine vinegar as a nod to the Italian salsa verde. I wanted a tiny bit of tartness but not enough to discolor the green herbs. You can use this sauce on almost anything–grilled meats, chicken or fish. It adds a nice herbaceous and slightly acidic bite to whatever you put it on, not to mention making your plates look quite expert and sophisticated! 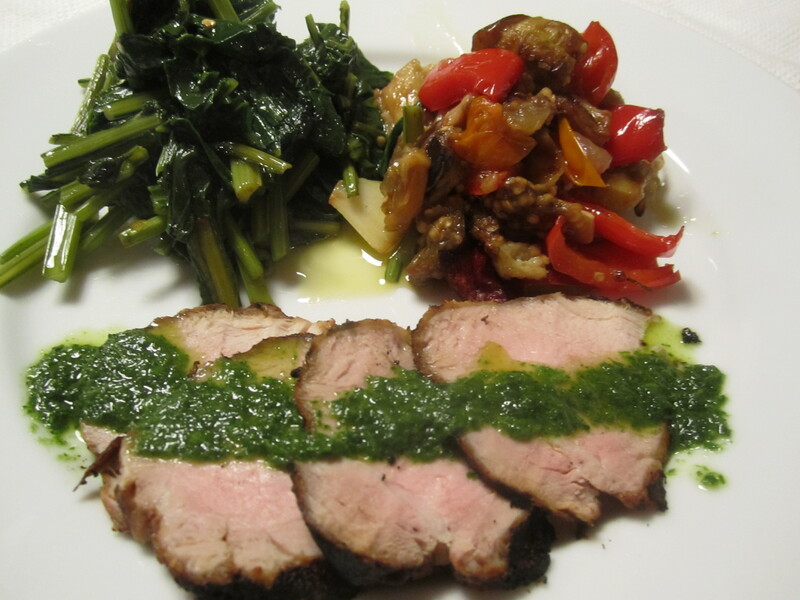 Tonight our dinner consisted entirely of recipes which I’ve posted before: dry-rubbed pork tenderloin, roasted eggplant, peppers and tomato, and sauteed beet greens with garlic and chili flakes (see mom’s pizza post). The tenderloin was grilled earlier, to be sliced thin and served at room temperature. I made the green sauce simply to liven it up and it was brilliant–it also tasted great with everything else on the plate. Place all ingredients in blender and process to a green paste. Add water if not easily pourable–it should be able to be drizzled with a spoon.